This One Handed Food Workstation has been designed to give independence, convenience and assistance with day to day kitchen tasks. It is ideal for those who have difficulty in gripping or have only one hand available. 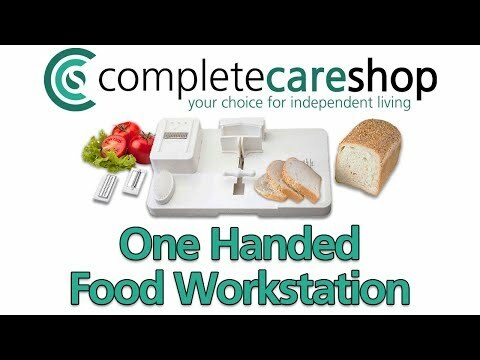 The workstation has a clamp that can grip all sorts of food, bowls, jars or bottles and that is very easy to operate. Stainless steel spikes, that are removable when not required, can be used to hold bread, fruit or vegetables securely in place for preparation. The workstation is also supplied with a grater and slicing box that mounts easily and securely onto the food preparation board when needed. High corner guards prevent the bread from slipping when being buttered. The Food Workstation has four non slip rubber feet that keep it securely in position during use.